It’s been a big week for Skype. The company launched video chat capability to its iPhone app last week and announced the acquisition of mobile video startup Qik today. The company has made another announcement, launching group calling functionality to its business offering for Windows PCs (the feature had previously been added to its consumer clients for Mac and Windows computers last year). The new version of Skype for enterprise allows businesses to have video calls with up to 10 concurrent participants, adding to the client’s existing chat, screen sharing and conference call features. 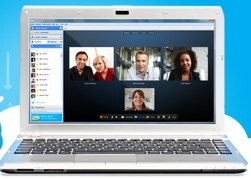 Group Video Calling for businesses is available from Skype for $8.99 per user per month. Group Calling for Skype’s business offering is a big deal when put in the context of Skype’s enterprise ambitions. When the VoIP company filed to go public, Skype publicly stated that it plans on adding enterprise products to its suite to help build additional revenues. Group Video calling is no doubt an incredibly useful feature for businesses. David Gurlé, General Manager and Vice President of Skype’s Enterprise business unit said in a statement, The Business version of Skype is great for live meetings and it offers a compelling low-cost option compared to competing solutions that are often complicated, costly or difficult to deploy. Approximately 37 percent of Skype users say they use Skype’s product platform occasionally or often for business-related purposes and Skype is hoping to raise that number as the company looks for new forms of revenue. Gurlé told us last fall that Skype is ramping up production of its enterprise products so I’d expect 2011 to be a big year for Skype’s business strategy.